The Federal Aviation Administration has advised passengers not to turn on or charge their Galaxy Note 7 smartphones on board aircraft, following reports of exploding batteries in the device made by Samsung Electronics. The U.S. aviation regulator said Thursday in a statement that in the light of the incidents and concerns raised by Samsung about the devices, it also advises passengers not to stow the phones away in any checked baggage. Samsung last week offered to replace the phones for its customers in the wake of 35 cases reported worldwide as of Sept. 1 that suggested a battery cell issue in some of the devices. The company said it was conducting an inspection with suppliers to identify possible affected batteries in the market. The company stopped meanwhile sales of the Galaxy Note 7. A consumer group protested against the manner the recall was conducted, claiming that the phones were being sold in the U.S. on Friday by multiple retailers after Samsung's announcement that it had stopped selling the phones. Consumer Reports said the recall had to be done officially with the involvement of the U.S. Consumer Product Safety Commission (CPSC), which would have made it illegal to sell the phones. CPSC is charged with protecting the public from risk of injury or death linked with consumer products under its jurisdiction. Samsung did not immediately comment on the FAA move. Three Australian airlines, including Qantas, its unit Jetstar and Virgin Australia, have prohibited their passengers from using or charging the Galaxy Note 7 during flights because of concerns over the phone's batteries, Reuters reported on Thursday. In a bid to placate customers, Samsung offered to swap existing Note 7 phones for newer versions of the model to be available in the next week. The U.S. 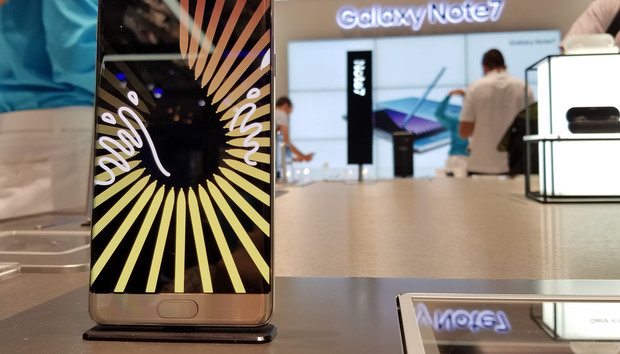 Product Exchange Program, announced Friday, for example, also offered to exchange current Galaxy Note 7 devices for a Galaxy S7 or Galaxy S7 edge and replacement of any Note 7 specific accessories, with a refund of the price difference between devices. Samsung also offered consumers a US$25 gift card or bill credit from select carrier retail outlets when choosing a Galaxy S7 family device or the Galaxy Note 7 within the exchange program.